Providing you the best range of galantamine tablets, imutrex tablet, pregabid 75 tablet, rasagiline tablets, respidon-2 tablets and sulbutiamine tablets with effective & timely delivery. Usage/Application Memory loss in Alzheimer's disease occurs due to disturbances of signal transmission in the brain. HOW TO USE GALAMER TABLETTake this medicine in the dose and duration as advised by your doctor. Swallow it as a whole. Do not chew, crush or break it. Galamer 4 Tablet is to be taken with food.HOW GALAMER TABLET WORKSMemory loss in Alzheimer’s disease occurs due to disturbances of signal transmission in the brain. 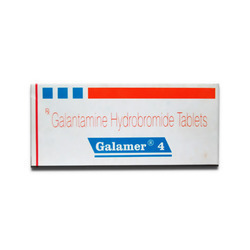 Galamer 4 Tablet is a cholinesterase inhibitor. It works by increasing the levels of a chemical messenger (acetylcholine) involved in transmmission of nerve signals. This improves memory and thinking.GALAMER TABLET RELATED WARNINGSAlcoholCAUTIONTaking Galantamine with alcohol can make you feel sleepyPregnancyPROBABLY SAFEGalamer 4 Tablet is probably safe to use during pregnancy. Animal studies have shown low or no adverse effect on the foetus, however, there are limited human studies. Please consult your doctor.LactationCAUTIONGalamer 4 Tablet is probably unsafe to use during lactation. Limited human data suggest that the drug could represent a significant risk to the baby.DrivingGalamer 4 Tablet may make you feel dizzy, sleepy, tired, or decrease alertness. If this happens, do not drive.KidneyGalamer 4 Tablet should be used with caution in patients with severe kidney disease. Dose adjustment of Galamer 4 Tablet may be needed. Please consult your doctor. However, use of this medicine is not recommended in patients with end-stage kidney disease.LiverCAUTIONGalamer 4 Tablet should be used with caution in patients with liver disease. Dose adjustment of Galamer 4 Tablet may be needed. Please consult your doctor. Use of Galamer 4 Tablet is not recommended in patients with severe liver disease.WHAT IF YOU MISS A DOSE OF GALAMER TABLET?If you miss a dose of Galamer 4 Tablet, skip it and continue with your normal schedule. Do not double the dose. We have marked a distinct position in the market by providing high-quality medicines to the clients. Our prestigious clients can avail these drugs from us in different quantities as per their specific requirements at pocket-friendly prices. HOW TO USE PREGABID CAPSULETake this medicine in the dose and duration as advised by your doctor. Swallow it as a whole. Do not chew, crush or break it. Pregabid 75 Capsule may be taken with or without food, but it is better to take it at a fixed time.HOW PREGABID CAPSULE WORKSPregabid 75 Capsule is an antiepileptic medication. It decreases pain and seizures by modulating calcium channel activity of the nerve cells.PREGABID CAPSULE RELATED WARNINGSAlcoholCAUTIONPregabid 75 Capsule may cause excessive drowsiness with alcohol.PregnancyWEIGH RISKS VS BENEFITSPregabid 75 Capsule may be unsafe to use during pregnancy. Animal studies have shown adverse effects on the foetus, however, there are limited human studies. The benefits from use in pregnant women may be acceptable despite the risk. Please consult your doctor.LactationCAUTIONPregabid 75 Capsule is probably unsafe to use during lactation. Limited human data suggest that the drug could represent a significant risk to the baby.DrivingPregabid 75 Capsule may make you feel dizzy, sleepy, tired, or decrease alertness. If this happens, do not drive.KidneyCAUTIONPregabid 75 Capsule should be used with caution in patients with kidney disease. Dose adjustment of Pregabid 75 Capsule may be needed. Please consult your doctor.LiverPregabid 75 Capsule is probably safe to use in patients with liver disease. Limited data available suggests that dose adjustment of Pregabid 75 Capsule may not be needed in these patients. Please consult your doctor.WHAT IF YOU MISS A DOSE OF PREGABID CAPSULE?If you miss a dose of Pregabid 75 Capsule, take it as soon as possible. However, if it is almost time for your next dose, skip the missed dose and go back to your regular schedule. Do not double the dose. Usage/Application Rasalect 0.5 Tablet may be taken with or without food, but it is better to take it at a fixed time. HOW TO USE RASALECT TABLETTake this medicine in the dose and duration as advised by your doctor. Swallow it as a whole. Do not chew, crush or break it. Rasalect 0.5 Tablet may be taken with or without food, but it is better to take it at a fixed time.HOW RASALECT TABLET WORKSRasalect 0.5 Tablet works by increasing the amount of dopamine, a chemical messenger that is needed to control movement in the brain.RASALECT TABLET RELATED WARNINGSAlcoholInteraction with alcohol is unknown. Please consult your doctor.PregnancyWEIGH RISKS VS BENEFITSRasalect 0.5 Tablet may be unsafe to use during pregnancy. Animal studies have shown adverse effects on the foetus, however, there are limited human studies. The benefits from use in pregnant women may be acceptable despite the risk. Please consult your doctor.LactationCAUTIONRasalect 0.5 Tablet is probably unsafe to use during lactation. Limited human data suggest that the drug could represent a significant risk to the baby.DrivingIt is not known whether Rasalect 0.5 Tablet alters the ability to drive. Do not drive if you experience any symptoms that affect your ability to concentrate and react.KidneyRasalect 0.5 Tablet is probably safe to use in patients with kidney disease. Limited data available suggests that dose adjustment of Rasalect 0.5 Tablet may not be needed in these patients. 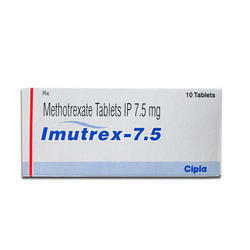 Please consult your doctor.LiverCAUTIONRasalect 0.5 Tablet should be used with caution in patients with liver disease. 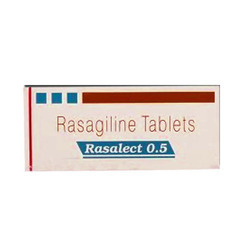 Dose adjustment of Rasalect 0.5 Tablet may be needed. Please consult your doctor. Use of Rasalect 0.5 Tablet is not recommended in patients with moderate and severe liver disease. Usage/Application Respidon 2 Tablet is an atypical antipsychotic. HOW TO USE RESPIDON TABLETTake this medicine in the dose and duration as advised by your doctor. Swallow it as a whole. Do not chew, crush or break it. Respidon 2 Tablet may be taken with or without food, but it is better to take it at a fixed time.HOW RESPIDON TABLET WORKSRespidon 2 Tablet is an atypical antipsychotic. It works by affecting the levels of chemical messengers (dopamine and serotonin) to improve mood, thoughts and behavior.RESPIDON TABLET RELATED WARNINGSAlcoholCAUTIONRespidon 2 Tablet may cause excessive drowsiness with alcohol.PregnancyWEIGH RISKS VS BENEFITSRespidon 2 Tablet may be unsafe to use during pregnancy. Animal studies have shown adverse effects on the foetus, however, there are limited human studies. The benefits from use in pregnant women may be acceptable despite the risk. Please consult your doctor.LactationCAUTIONRespidon 2 Tablet is probably unsafe to use during lactation. Limited human data suggest that the drug could represent a significant risk to the baby.DrivingRespidon 2 Tablet may make you feel dizzy, drowsy or affect your vision. Do not drive until your vision is clear.KidneyCAUTIONRespidon 2 Tablet should be used with caution in patients with kidney disease. Dose adjustment of Respidon 2 Tablet may be needed. 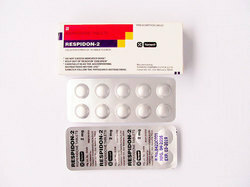 Please consult your doctor.LiverCAUTIONRespidon 2 Tablet should be used with caution in patients with liver disease. Dose adjustment of Respidon 2 Tablet may be needed. Please consult your doctor. USES OF ARCALION TABLETArcalion Tablet is used in the treatment of Alzheimer's disease, stroke, dementia in Parkinson's disease, age related memory loss and head injury.HOW TO USE ARCALION TABLETTake this medicine in the dose and duration as advised by your doctor. Swallow it as a whole. Do not chew, crush or break it.HOW ARCALION TABLET WORKSArcalion Tablet increases the level of a chemicals often act as messsanger molecules (known technically as neurotransmitters) in brain. It also decreases damage of the brain.ARCALION TABLET RELATED WARNINGSAlcoholThere is no data available. Please consult doctor before consuming the drug.PregnancyThere is no data available. Please consult doctor before consuming the drug.LactationNo information is available on the use of Arcalion Tablet during lactation. Please consult your doctor.DrivingIt is not known whether Arcalion Tablet alters the ability to drive. Do not drive if you experience any symptoms that affect your ability to concentrate and react.KidneyThere is limited information available on the use of Arcalion Tablet in patients with kidney disease. Please consult your doctor.LiverThere is limited information available on the use of Arcalion Tablet in patients with liver disease. Please consult your doctor.WHAT IF YOU MISS A DOSE OF ARCALION TABLET?If you miss a dose of Arcalion Tablet, skip it and continue with your normal schedule. Do not double the dose. Usage/Application Zolmist Nasal Spray is rapidly absorbed into the bloodstream through the inner lining of the nose. HOW TO USE ZOLMIST NASAL SPRAYUse this medicine in the dose and duration as advised by your doctor. Check the label for directions before use. Insert the bottle tip into one nostril and close the other nostril. Direct the spray away from the cartilage diving the two sides of your nose and toward the sides of your nostril. As you spray, breath gently and keep the head upright. Repeat in the other nostril.HOW ZOLMIST NASAL SPRAY WORKSMigraine headaches are thought to result from the dilatation (swelling) of blood vessels in the head. 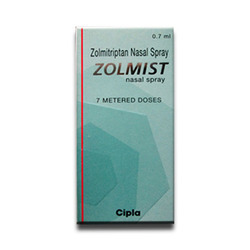 Zolmist Nasal Spray is rapidly absorbed into the bloodstream through the inner lining of the nose. Once absorbed, it works by constricting (narrowing) the blood vessels in the head, stops transmission of pain signals to the brain, and blocks the release of chemicals that cause nausea and other migraine symptoms. This relieves the migraine attack.ZOLMIST NASAL SPRAY RELATED WARNINGSAlcoholNo interaction found/establishedPregnancyWEIGH RISKS VS BENEFITSZolmist Nasal Spray may be unsafe to use during pregnancy. HOW TO USE ZONIMID CAPSULETake this medicine in the dose and duration as advised by your doctor. Swallow it as a whole. Do not chew, crush or break it. Zonimid 50 Capsule may be taken with or without food, but it is better to take it at a fixed time.HOW ZONIMID CAPSULE WORKSZonimid 50 Capsule is an antiepileptic medication. 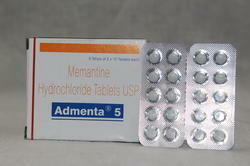 It prevents seizures in patients with epilepsy by suppressing the abnormal and excessive activity of the nerve cells in the brain.ZONIMID CAPSULE RELATED WARNINGSAlcoholCAUTIONZonimid 50 Capsule may cause excessive drowsiness with alcohol.PregnancyWEIGH RISKS VS BENEFITSZonimid 50 Capsule is unsafe to use during pregnancy. There is positive evidence of human fetal risk, but the benefits from use in pregnant women may be acceptable despite the risk, for example in life-threatening situations. Please consult your doctor.LactationCAUTIONZonimid 50 Capsule is probably unsafe to use during lactation. Limited human data suggest that the drug could represent a significant risk to the baby.DrivingDo not drive unless you are feeling well. As Zonimid 50 Capsule may affect your concentration, ability to react/respond, and may make you feel sleepy, particularly at the beginning of your treatment or after your dose is increased.KidneyCAUTIONZonimid 50 Capsule should be used with caution in patients with kidney disease. Dose adjustment of Zonimid 50 Capsule may be needed. Please consult your doctor.LiverCAUTIONZonimid 50 Capsule should be used with caution in patients with liver disease. 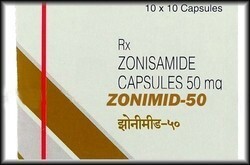 Dose adjustment of Zonimid 50 Capsule may be needed. Please consult your doctor. Use of Zonimid 50 Capsule is not recommended in patients with severe liver disease.WHAT IF YOU MISS A DOSE OF ZONIMID CAPSULE?If you miss a dose of Zonimid 50 Capsule, skip it and continue with your normal schedule. Do not double the dose. 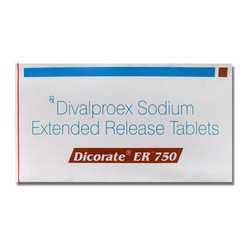 Usage/Application Clinaxon 500 Tablet is a nerve protecting medicine. HOW TO USE CLINAXON TABLETTake this medicine in the dose and duration as advised by your doctor. Swallow it as a whole. Do not chew, crush or break it. 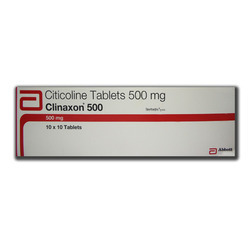 Clinaxon 500 Tablet may be taken with or without food, but it is better to take it at a fixed time.HOW CLINAXON TABLET WORKSClinaxon 500 Tablet is a nerve protecting medicine. It works on the brain by nourishing the nerve cells, protects them from damage and improves their survival.CLINAXON TABLET RELATED WARNINGSAlcoholInteraction with alcohol is unknown. Please consult your doctor.PregnancyUnknown. Human and animal studies are not available. Please consult your doctor.LactationNo information is available on the use of Clinaxon 500 Tablet during lactation. Please consult your doctor.DrivingIt is not known whether Clinaxon 500 Tablet alters the ability to drive. Do not drive if you experience any symptoms that affect your ability to concentrate and react.KidneyThere is limited information available on the use of Clinaxon 500 Tablet in patients with kidney disease. Please consult your doctor.LiverThere is limited information available on the use of Clinaxon 500 Tablet in patients with liver disease. Please consult your doctor. Usage/Application Amazeo OD 400 Tablet is an atypical antipsychotic. HOW TO USE AMAZEO OD TABLET SRTake this medicine in the dose and duration as advised by your doctor. Swallow it as a whole. Do not chew, crush or break it. Amazeo OD 400 Tablet may be taken with or without food, but it is better to take it at a fixed time.HOW AMAZEO OD TABLET SR WORKSAmazeo OD 400 Tablet is an atypical antipsychotic. It works by modulating the action of certain chemical messengers in the brain that affect thoughts.AMAZEO OD TABLET SR RELATED WARNINGSAlcoholInteraction with alcohol is unknown. 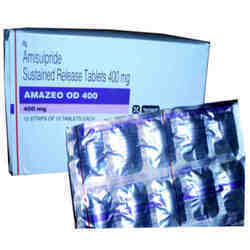 Please consult your doctor.PregnancyWEIGH RISKS VS BENEFITSAmazeo OD 400 Tablet may be unsafe to use during pregnancy. Animal studies have shown adverse effects on the foetus, however, there are limited human studies. The benefits from use in pregnant women may be acceptable despite the risk. Please consult your doctor.LactationCAUTIONAmazeo OD 400 Tablet is probably unsafe to use during lactation. Limited human data suggest that the drug could represent a significant risk to the baby.DrivingDo not drive unless you are feeling well. You may feel less alert, drowsy or sleepy while taking this medicine. This may affect your driving ability.KidneyCAUTIONAmazeo OD 400 Tablet should be used with caution in patients with kidney disease. Dose adjustment of Amazeo OD 400 Tablet may be needed. Please consult your doctor. Use of Amazeo OD 400 Tablet is not recommended in patients with severe kidney disease.LiverAmazeo OD 400 Tablet is probably safe to use in patients with liver disease. Limited data available suggests that dose adjustment of Amazeo OD 400 Tablet may not be needed in these patients. Please consult your doctor. HOW TO USE GRAVOL TABLETTake this medicine in the dose and duration as advised by your doctor. Swallow it as a whole. Do not chew, crush or break it. Gravol Tablet may be taken with or without food, but it is better to take it at a fixed time.HOW GRAVOL TABLET WORKSGravol Tablet is an antihistaminic medication. It blocks the action of certain chemical messengers that are responsible for inflammation, congestion, itching, and other allergic reactions.GRAVOL TABLET RELATED WARNINGSAlcoholCAUTIONGravol Tablet may cause excessive drowsiness with alcohol.PregnancyPROBABLY SAFEGravol Tablet is probably safe to use during pregnancy. Animal studies have shown low or no adverse effect on the foetus, however, there are limited human studies. Please consult your doctor.LactationGravol Tablet is probably safe to use during lactation. Limited human data suggests that the drug does not represent a significant risk to the baby. Larger doses or prolonged use of Gravol Tablet may cause sleepiness and other effects in the babyDrivingGravol Tablet may make you feel dizzy, sleepy, tired, or decrease alertness. If this happens, do not drive.KidneyThere is limited information available on the use of Gravol Tablet in patients with kidney disease. Please consult your doctor.LiverThere is limited information available on the use of Gravol Tablet in patients with liver disease. 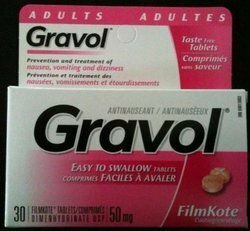 Please consult your doctor.WHAT IF YOU MISS A DOSE OF GRAVOL TABLET?If you miss a dose of Gravol Tablet, take it as soon as possible. However, if it is almost time for your next dose, skip the missed dose and go back to your regular schedule. Do not double the dose. Usage/Application Duvanta 30 Tablet may be taken with or without food, but it is better to take it at a fixed time. HOW TO USE DUVANTA TABLETTake this medicine in the dose and duration as advised by your doctor. Swallow it as a whole. Do not chew, crush or break it. Duvanta 30 Tablet may be taken with or without food, but it is better to take it at a fixed time.HOW DUVANTA TABLET WORKSDuvanta 30 Tablet works by increasing the levels of chemical messengers (serotonin and noradrenaline), natural substances in the brain that help maintain mental balance and stop the movement of pain signals in the brain.DUVANTA TABLET RELATED WARNINGSAlcoholCAUTIONDuvanta 30 Tablet may cause excessive drowsiness with alcohol.PregnancyWEIGH RISKS VS BENEFITSDuvanta 30 Tablet may be unsafe to use during pregnancy. Animal studies have shown adverse effects on the foetus, however, there are limited human studies. The benefits from use in pregnant women may be acceptable despite the risk. Please consult your doctor.LactationCAUTIONDuvanta 30 Tablet is probably unsafe to use during lactation. Limited human data suggest that the drug could represent a significant risk to the baby.DrivingDuvanta 30 Tablet may make you feel dizzy, sleepy, tired, or decrease alertness. If this happens, do not drive.KidneyDuvanta 30 Tablet should be used with caution in patients with severe kidney disease. Dose adjustment of Duvanta 30 Tablet may be needed. Please consult your doctor. Dose adjustment is not recommended in patients with mild and moderate kidney disease.LiverUNSAFEDuvanta 30 Tablet is probably unsafe to use in patients with liver disease and should be avoided. Please consult your doctor.WHAT IF YOU MISS A DOSE OF DUVANTA TABLET?If you miss a dose of Duvanta 30 Tablet, take it as soon as possible. However, if it is almost time for your next dose, skip the missed dose and go back to your regular schedule. Do not double the dose. 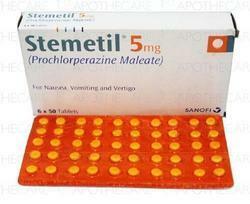 Usage/Application Stemetil 5 mg Tablet MD is a dopamine antagonist. HOW TO USE STEMETIL TABLET MDTake this medicine in the dose and duration as advised by your doctor. Do not handle the tablets with wet hands. Put it in your mouth but do not swallow it. Stemetil MD 5 mg Tablet is to be taken with food.HOW STEMETIL TABLET MD WORKSStemetil MD 5 mg Tablet is a dopamine antagonist. It works by blocking the dopamine receptors in the region of brain that controls nausea and vomiting.STEMETIL TABLET MD RELATED WARNINGSAlcoholCAUTIONStemetil MD 5 mg Tablet may cause excessive drowsiness with alcohol.PregnancyUnknown. Human and animal studies are not available. Please consult your doctor.LactationCAUTIONStemetil MD 5 mg Tablet is probably unsafe to use during lactation. Limited human data suggest that the drug could represent a significant risk to the baby. Occasional short-term use of Stemetil MD 5 mg Tablet for the treatment of nausea and vomiting poses little risk to the breastfed infant.DrivingStemetil MD 5 mg Tablet may make you feel dizzy, sleepy, tired, or decrease alertness. If this happens, do not drive.KidneyCAUTIONStemetil MD 5 mg Tablet should be used with caution in patients with kidney disease. Dose adjustment of Stemetil MD 5 mg Tablet may be needed. Please consult your doctor.LiverCAUTIONStemetil MD 5 mg Tablet should be used with caution in patients with liver disease. Dose adjustment of Stemetil MD 5 mg Tablet may be needed. Please consult your doctor. 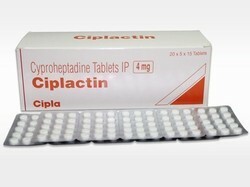 HOW TO USE CIPLACTIN TABLETTake this medicine in the dose and duration as advised by your doctor. Swallow it as a whole. Do not chew, crush or break it. Ciplactin 4 mg Tablet may be taken with or without food, but it is better to take it at a fixed time.HOW CIPLACTIN TABLET WORKSCiplactin 4 mg Tablet is an antihistaminic medication. It blocks the action of certain chemical messengers that are responsible for inflammation, congestion, itching, and other allergic reactions.CIPLACTIN TABLET RELATED WARNINGSAlcoholCAUTIONCiplactin 4 mg Tablet may cause excessive drowsiness with alcohol.PregnancyPROBABLY SAFECiplactin 4 mg Tablet is probably safe to use during pregnancy. Animal studies have shown low or no adverse effect on the foetus, however, there are limited human studies. Please consult your doctor.LactationCiplactin 4 mg Tablet is probably safe to use during lactation. Limited human data suggests that the drug does not represent a significant risk to the baby. Unless Ciplactin 4 mg Tablet is used to lower the prolactin levels in the mother, it should be avoided as it might interfere with breastfeeding.DrivingDo not drive unless you are feeling well. Ciplactin 4 mg Tablet may cause dizziness, sedation, and hypotension in elderly patients. This may affect your ability to drive.KidneyCiplactin 4 mg Tablet should be used with caution in patients with severe kidney disease. Dose adjustment of Ciplactin 4 mg Tablet may be needed. Please consult your doctor.LiverThere is limited information available on the use of Ciplactin 4 mg Tablet in patients with liver disease. Please consult your doctor.WHAT IF YOU MISS A DOSE OF CIPLACTIN TABLET?If you miss a dose of Ciplactin 4 mg Tablet, take it as soon as possible. However, if it is almost time for your next dose, skip the missed dose and go back to your regular schedule. Do not double the dose.